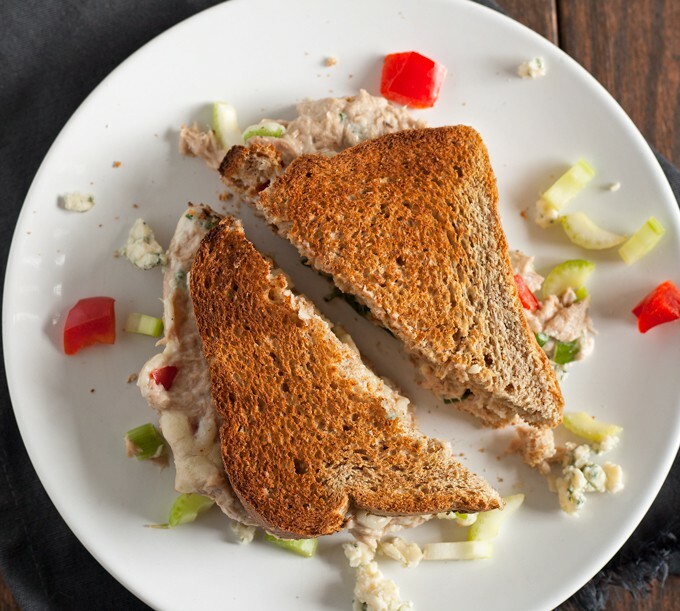 This blue cheese tuna melt is great for weekend lunches and brunch. Blue cheese is added to the tuna and American cheese is melted on top. This twist on an American classic can also be served open-face! Originally published September 2014, photos updated October 2015. I think winter is coming. Fall may have just arrived, but I heard some weather reports about fall foliage being at 60 percent in the North Woods of Wisconsin. And if you know anything about that stuff, that means fall is fast approaching. And winter too. Don’t worry, this isn’t a weather post. 🙂 Though that is mighty tempting. This is more a report on what we do when the weather starts changing. Or rather, what I do. I, unfortunately, am one of those people who start to eat more when the seasons change. I guess I am trying to build my own coat of fat for the winter or something. Does that mean I can hold off buying a new warm winter coat or something? Doubtful. A girl can dream! Despite my best efforts, I always put on 5 pounds or so every winter. And I’m on the lookout right now. I noticed the dog eating a little more, and then caught myself eating more too. This blue cheese tuna melt is a result of me eating lunch one day and getting bored with my usual sandwich routine. On a traditional tuna melt, I would use cheddar cheese but with this sandwich, I really wanted the blue cheese to stand out. I could have added more blue cheese, but I find it can be very overwhelming sometimes. Instead, I was careful to use just the right amount of blue cheese and a very mild cheese (American) to get all melty. 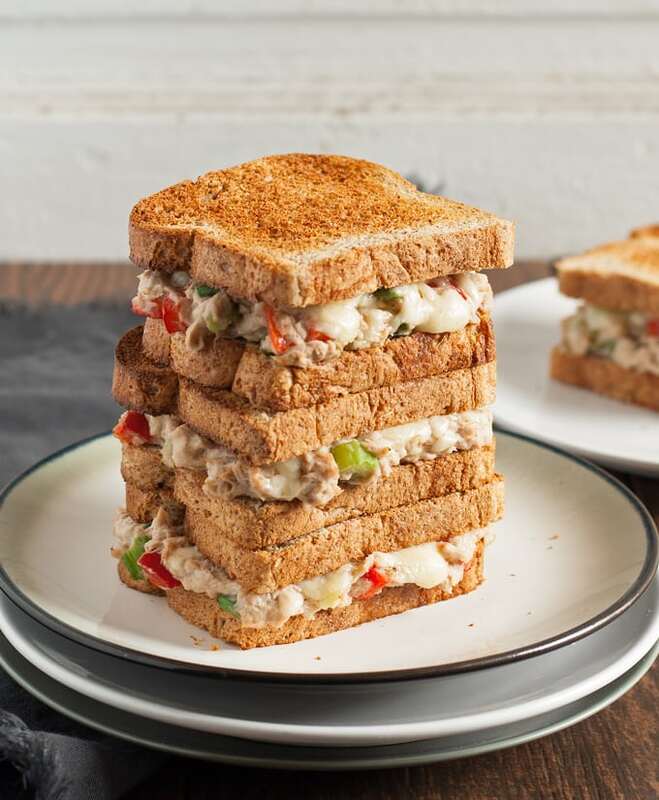 If you want a more “wet” tuna, add more mayo – I was trying to watch how much mayo I used (winter weight and all….). If you are watching carbs, then serve this sandwich open face. If you aren’t… well, then embrace your love of bread! Pre-heat an oven to 400 degrees or turn on the broiler. 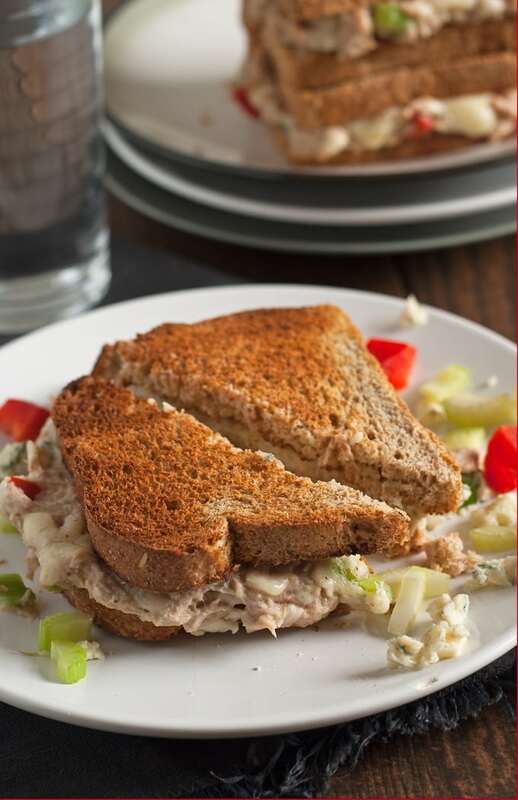 In a small bowl, combine the green onions, celery, red bell pepper, tuna, mayo, blue cheese and salt and pepper. Mix well. Toast your bread. 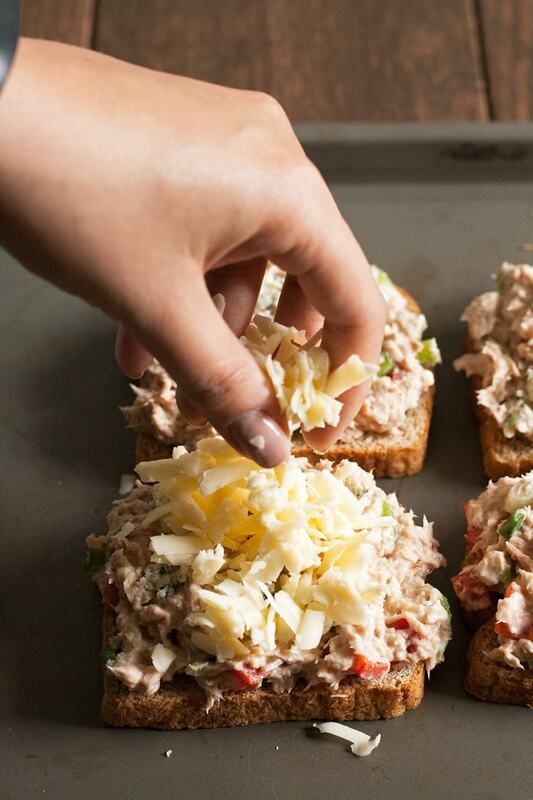 On 4 slices of bread, put a 1/4 of the tuna mixture. Top each sandwich half with 2 ounces of shredded cheese (or one slice of cheese). Place sandwiches on a baking sheet and put in the oven or broiler for 5-7 minutes, or until the cheese is melted. Remove from oven. Top each sandwich with a piece of bread and serve. Step up your sandwich game with this panini press. Looking for more sandwich recipes? Try these grilled cheese sandwiches: spicy apple bacon grilled cheese or gouda jalapeño roasted red pepper grilled cheese! I think I know what I’m having for lunch today! Looks good1I want to try this. This sounds like an interesting recipe, I never would have thought of that! this sandwich looks delicious. I’m going to have one of theses for luch tomorrow at school !!!!! Tuna melts are my weakness! This looks absolutely delicious! I have never had blue cheese though, but will definitely give it a try! P.S. I always tend to eat more during the fall and winter too! Mmmm…salmon sounds delicious. 🙂 I will have to try that next. OMG That looks so freakin good! 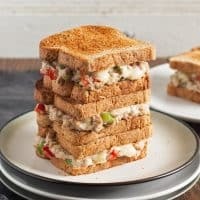 I haven’t had a tuna melt in ages, and this looks like a great version to try. Thanks for sharing! This looks super-yummy! Blue cheese and tuna is a combination I have not tried. While blue cheese is not my favorite, I know a lot of people who may enjoy this. thanks for sharing. I’m a huge Blue Cheese fan, so I’m definitely going to have to make this! YUM! 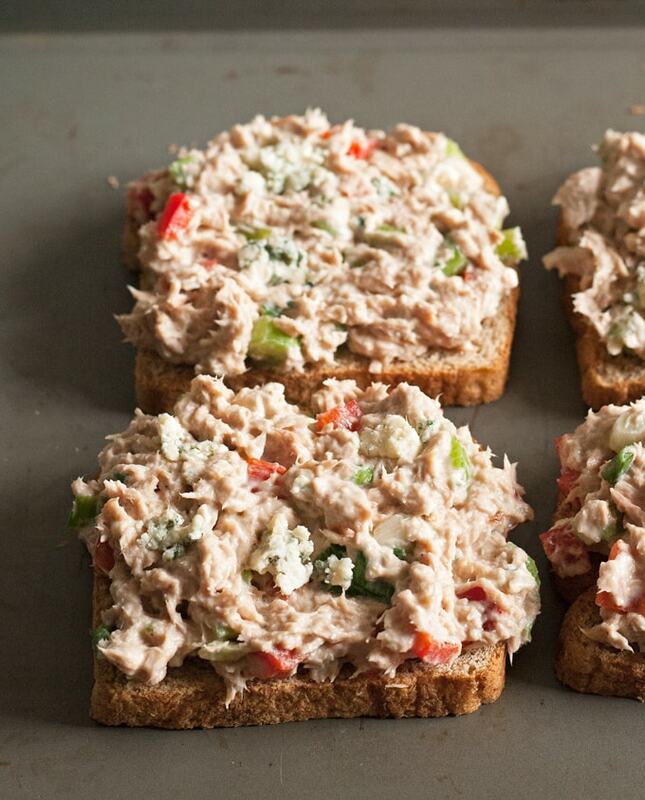 Wow, this recipe looks SO divine and really takes tuna to a different, classier level! Love it, will have to save it! 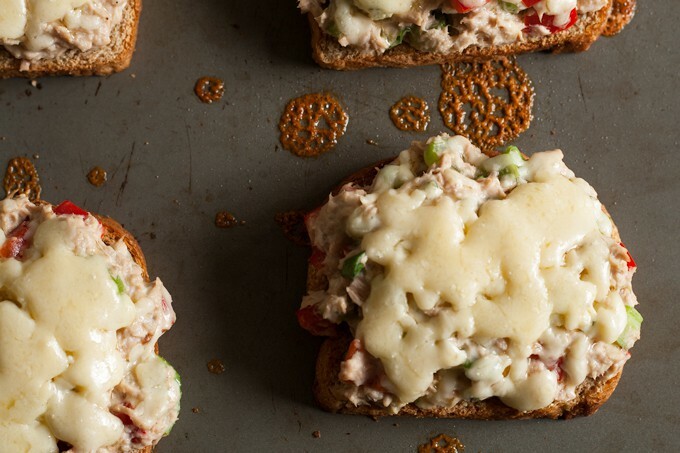 I love Tuna Melts, and this interesting take on it looks delicious! I will have to give it a try on one of these cold fall weekends! I don’t like tuna but I think this would be great with chicken salad as well. Definitely want to try it. This was amazing, 5 stars!!!!! The blue cheese gave the tuna more of a crab meat type taste, in my opinion, which I LOVED. So so SO perfect! Thank you!!!! !